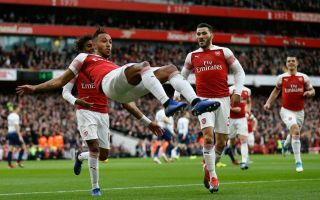 Arsenal forward Pierre-Emerick Aubameyang has hit out at the Tottenham fan who threw a banana skin onto the pitch during the north London derby on Sunday. The Gunners emerged 4-2 winners after a thrilling encounter at the Emirates, but as seen in the image below shared on the Gabon international’s Instagram account, there was an unsavoury incident during the clash. As per the Daily Star, four people have been charged after trouble during the game, although it isn’t made clear which individual specifically threw the banana skin after Aubameyang had scored. While rivalries are certainly healthy in football, this is a case of things going way past the line unfortunately and it soured what was a great advert for the Premier League. Nevertheless, Aubameyang had the last laugh by guiding Arsenal to victory, while he asked: “#Why’sManDoingThis?” on Instagram, as seen in his post below. Meanwhile, The Guardian add that Tottenham could face an FA enquiry as a result of the incident, and so this situation could rumble on for some time while Arsenal continue to build momentum having leapfrogged their rivals into fourth place in the Premier League table with their win. Further, that’s now 12 goals in 18 appearances for Aubameyang so far this season, as he continues to fire them towards their objectives with Man Utd his next target as the two giants of English football clash at Old Trafford on Wednesday night.